Typical hamsters, known interchangeably as Syrian, golden or teddybear (Mesocrictus auratus) hamsters, originated in Syria, where they live in the wild as desert rodents. These are larger and require a bit more space in their mazes than their smaller cousins the dwarf hamsters (Cricetus spp. ), but all will enjoy a DIY maze made just for them. Nearly any hamster maze can be made from ordinary items found around your house. It's a snap to make a maze for your hamster from cardboard. All you need are scissors or a sharp utility knife, some glue and a supply of cardboard boxes. Use one large box as the frame, and glue cardboard strips to the bottom inside, forming the sides of the maze, in whatever configuration you prefer. Make the strips high enough that your hamster doesn't merely climb over, and don't make it so complicated he can never figure it out. Play fair -- make sure there is a solution and reward him with treats at the end. Add removable cardboard tubes or really small boxes with entry/exit holes cut in them as tunnels and rest stops, and move them around occasionally to keep him stimulated. If you're handy and want a more permanent maze, make it out of wood. Use a hardwood like oak, birch or walnut. Resinous woods like pine and cedar emit fumes that could make your hamster sick. Make a box and use short lengths of boards as the maze dividers -- exactly as with the cardboard maze. To fasten them in place, use wood glue. You can easily put together a maze for your hamster using cardboard tubes or empty plastic soft drink bottles. Cut the tops and bottoms of soft drink containers and cut a few small holes in the sides for ventilation -- to keep your pet from over-heating -- before joining those together with a flexible vinyl tape such as electrical tape. Cut and assemble cardboard tubes with ordinary scissors and white glue. For a sturdier tube maze, join PVC pipes together by friction-fitting elbows and tees in various ways. Rearrange the joints every so often to keep your hamster interested. Remember to drill air holes in the PVC pipe before assembly. If you have a new pet hamster, don't just plop him down in the maze. 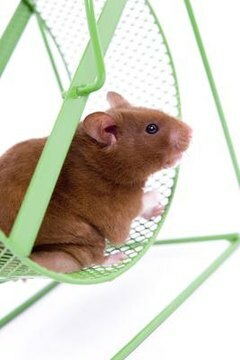 True, hamsters need exercise and things to keep them from becoming bored, and mazes work well for both, but your new hamster needs time to get used to you first. If you put him in a maze in a large room, he may escape if he is unused to it or you. Even after you bond, always supervise his activities in a safe way. Never put the maze on a table top or other high place where he could get hurt if he falls, and make his play area a safe and easily secured room with no gaps he could slip through under or around doors or windows, and no electrical wires within his reach that he could chew on and be shocked by.